One of the things that makes Walt Disney World such a special place is the amazing level of detail found throughout the four theme parks, two water parks, Disney Resorts, and Disney Springs. No matter where a guest spends their time, they are sure to feel transported to different places in location and time thanks to immersive and beautiful details. Found amongst the details throughout Walt Disney World are Hidden Mickeys which are images that come together to form Mickey Mouse or another familiar Disney character like Minnie, Donald, or Goofy. Hidden Mickeys can be found in everything ranging from artwork and décor to strategically placed props and greenery. With so many Hidden Mickeys to find, guests love to spend time on their Disney vacations trying to spot them all. Of the four theme parks, Epcot is home to some amazing Hidden Mickeys which range from easy to spot to extremely difficult. Here are the top ten Hidden Mickeys to find in Epcot on a Walt Disney World vacation. 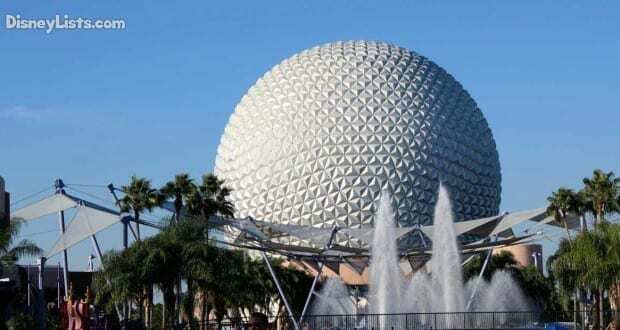 One of the most recognizable attractions in Epcot is Spaceship Earth which is housed inside the massive geodesic dome found just inside the entrance to the park. Guests who enjoy a ride on the attraction travel from the beginning of time to modern day to celebrate the history of communication. Throughout the attraction, guests can enjoy many audio animatronics reenacting important moments in history like the invention of the printing press and man landing on the moon. When moving through the Renaissance scene, guests should look to the left hand side of their Time Machines just before passing by the sculptor to spot a Hidden Mickey formed by three paint rings on a table. An attraction in Epcot’s Future World which is sure to have guests tapping into the power of their imaginations is Journey Into Imagination with Figment. The attraction brings guests into the Imagination Institute where Dr. Nigel Channing is hosting a tour of the facilities’ sensory laboratories. Figment the lovable dragon soon interrupts and demonstrates how imagination works best when set free. At one point during the attraction, Figment brings guests to his own house that has been turned upside down. Guests who look closely can spot a classic Hidden Mickey formed by three onion rings being served in Figment’s kitchen. The Canada Pavilion in World Showcase is home to shopping, dining, and experiences which help guests embrace the spirit and diversity of the country. Just after climbing up the large set of stairs in the front of the pavilion, guests can spot a cluster of totem poles with intricate carvings on them. 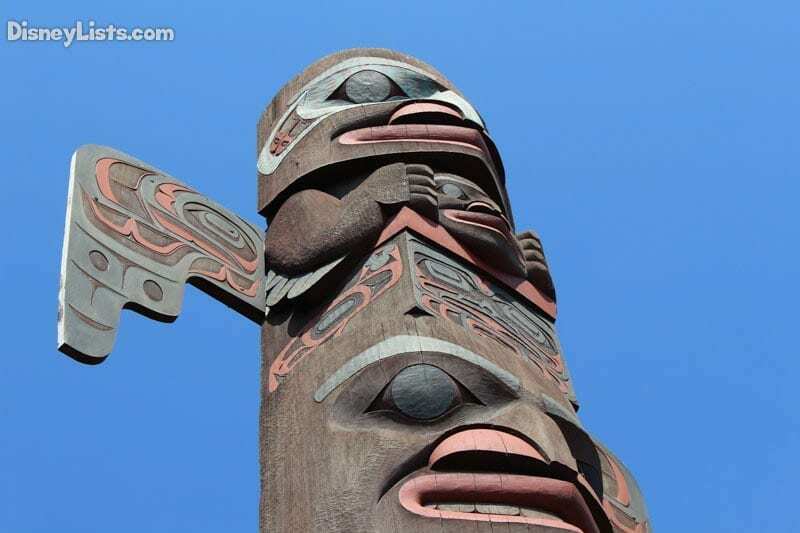 The totem pole on the left hand side features a Hidden Mickey found near the very top. Journey Into Imagination with Figment is home to several other Hidden Mickeys including one that can be found in the laboratory dedicated to visual effects and imagination. Guests can spot many different illusions and props that demonstrate how eyes can play tricks at times as well as a classic Hidden Mickey drawn on the whiteboard found to the right hand side of the scene. The Land Pavilion in Epcot’s Future World is home to an attraction which showcases the determination and importance of the land. Living with the Land brings guests on a boat tour that first demonstrates how the land can thrive in all sorts of different environments. Guests then move through a series of greenhouses and habitats which showcase many different types of plants and vegetation. At one point during Living with the Land, guests move past a series of tubes which are home to shrimp and a Hidden Mickey made out of circles of wire paneling. In another area of the greenhouses in Living with the Land, guests glide in between two massive tables which are growing different types of lettuce. Depending on how grown the lettuce is, guests can spot designs on the tables like the Epcot logo and a massive Hidden Mickey! Also found in The Land Pavilion is a restaurant which serves up fresh foods often grown inside the greenhouses of Living with the Land. The Garden Grill Restaurant is open for breakfast, lunch, and dinner and serves up a family style meal while guests meet Mickey, Pluto, Chip, and Dale. The restaurant is also unique in that it slowly rotates throughout each meal so that guests can enjoy different views for each course. One view at The Garden Grill Restaurant features a massive mural depicting all kinds of beautiful plants and vegetation. Guests who look very closely at the mural can spot a Hidden Mickey peering out from behind some horizontal ferns. The American Adventure is a wonderful attraction which can be found in the America Pavilion in World Showcase. The attraction combines artwork, audio animatronics, and a narration by Mark Twain and Benjamin Franklin to share the story of the American people. Before entering into the theater to enjoy the attraction, guests can explore a lobby which features plenty of historical artifacts and artwork. 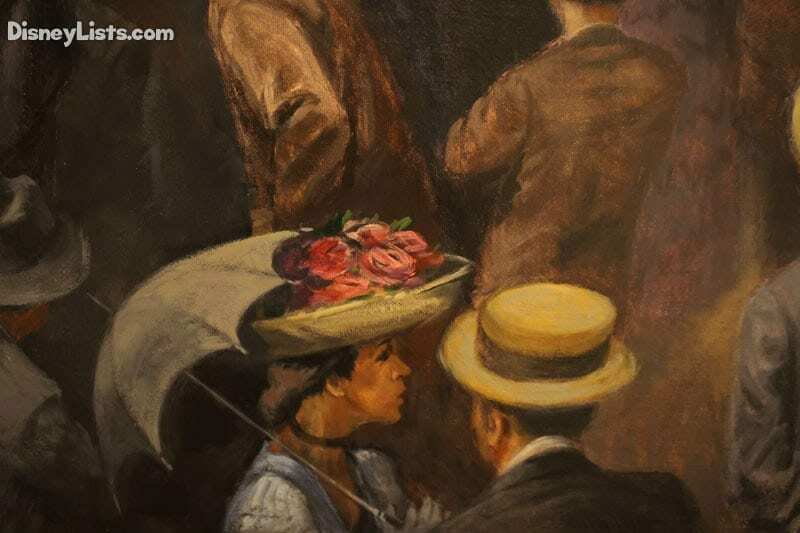 One painting depicts a man delivering a speech to a large crowd and guests can look to the bottom of the painting to spot a classic Hidden Mickey formed by three roses on a woman’s hat. Guests who visit the Germany Pavilion in World Showcase can spend time enjoying classic architecture, shopping, dining, and culture that will trick them into thinking they are really in Germany. A great place to stop and enjoy while in the pavilion is the Karamell Kuche shop which sells all kinds of delicious caramels and candy. Just inside one of the shop’s doorways, guests can spot a Hidden Mickey growing out of a decorative vine on a shelf. The Mexico Pavilion is home to an attraction which brings guests on a scenic tour of the country with some familiar faces. The Gran Fiesta Tour Starring the Three Caballeros is a boat ride that brings guests on a journey across Mexico with Panchito and Jose to find Donald in time for their concert. In the final scene of the attraction, guests can spot a boat on their left hand side with a banner that reads “Viva Donald!” A Hidden Mickey can be spotted on the front right hand side of that boat formed by three drums.